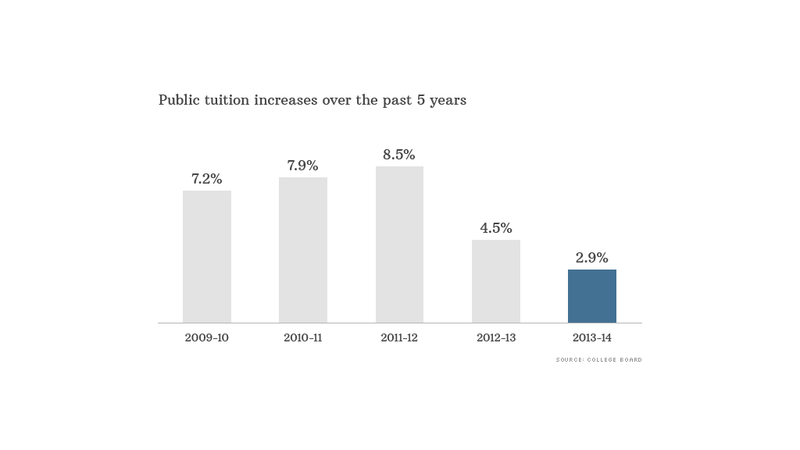 Public university tuition skyrocketed when state governments started reducing taxpayer support for colleges. But now that some states have started to restore funding, price hikes are starting to moderate. The gravity-defying trajectory of the cost of college finally appears to be losing momentum, with tuition at public universities this academic year rising at its slowest rate in decades. "It's not back to where it was before, but at least it's not going in the wrong direction," he said. "And hopefully, this trend will continue." Yet, tuition is still growing faster than most families' incomes: Since 2002, median family income has risen just 1.9% annually, the Census Bureau reports. Other college costs are also rising faster than household incomes. Add in room and board, books, and other campus costs, and the full sticker price of attending Your State U totals $22,800, up 2.7% from last year. That's about 60% higher than the full cost of attendance a decade ago. Of course, at least half of all undergrads get grants or tax credits that mean they pay a lower "net" price. Bargain states: The University of Wyoming charges only $4,404 a year for in-state students, a price increase of just 3.5%. And the University of South Dakota charges out-of-staters about $10,000 a year in tuition and fees, which is lower than the in-state charges for more than 20 other states' flagship schools. Reduced borrowing: While 60% of 2012 graduates had college debt averaging a record $26,500, today's students appear to be borrowing less.